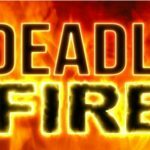 The Name of the woman killed in a house fire Tuesday morning in Yelleville has been released. The victim was identified as 41 year old Shawna Hammond. a man was also seriously injured in the fire, he is identified as 21 year old Michael Nemeth. Nemeth was airlifted to a Springfield hospital and is still listed in critical but stable condition. Preliminary investigation by the emergency management office point to the fire being electrical.